A Writer's World | Bookworms | Kids VT - small people, big ideas! I first encountered the Vermont Reads Program in 2006, when Hardwick's Buffalo Mountain Co-op handed out free copies of Natalie Kinsey-Warnock's As Long As There Are Mountains. In this middle school novel, the young main character's father is injured in a logging mishap; coincidentally, my 8-year-old daughter's father had recently experienced a near-fatal chainsaw accident. My daughter was both terrified and entranced with the book, emphasizing for me literature's draw, even for the youngest readers and listeners. 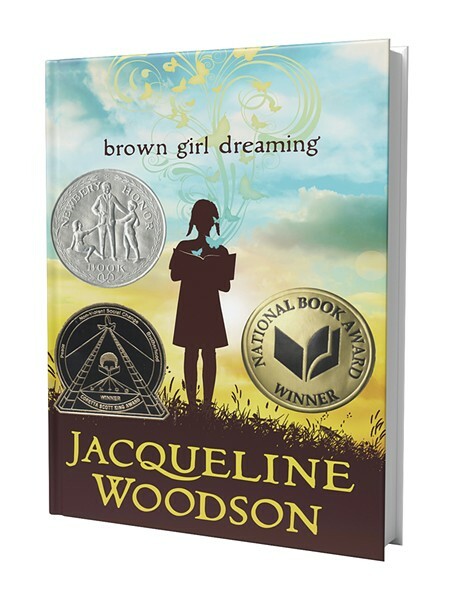 Jacqueline Woodson's Brown Girl Dreaming is the 2017 Vermont Reads pick (see below). The lyrical memoir-in-verse of a young girl becoming a writer has received numerous awards, including a National Book Award and a Newbery Honor Award. Woodson's personal story unfolds within the wider cultural context of an extended family in the turbulent 1960s and 70s, and their migratory journey from South Carolina to New York. From her home in Brooklyn, Woodson graciously spent time talking with Kids VT about writing and growing up, in advance of her October 23 talk at Burlington High School. KIDS VT: Congratulations on Brown Girl Dreaming being chosen as the 2017 Vermont Reads pick. Can you talk about what this means to you? 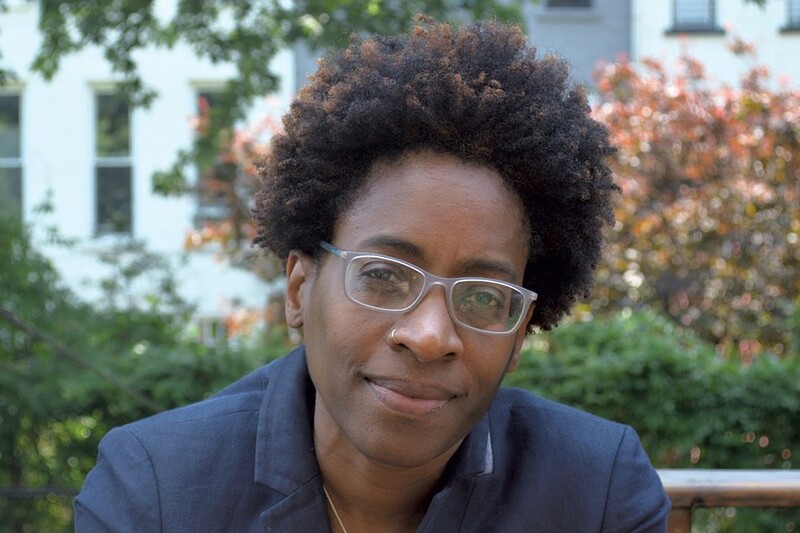 JACQUELINE WOODSON: When I was writing Brown Girl Dreaming, I had no idea what the book's outcome would be and that it would be so well liked — especially in a state like Vermont, which is pretty white. Vermont is doing its work, and showing windows into the wider world. KVT: In the book, you describe yourself as a slow reader. How did this help you become a writer? JW: By reading slowly and rereading books, I was studying other writers and learning how they did what they did, although of course I didn't realize it at the time. I loved so many things I read that I took ownership through memory, and that led me to understand how to write. KVT: You've said that, as a child, you didn't read books about yourself, your neighborhood or your family, because your library lacked a diversity of literature. What was it like to grow up reading books that didn't reflect your life? JW: Literature tells your story and gives you a sense of your own legitimacy. Not finding myself in literature, I wondered if my story wasn't relevant. I was getting mad, because I wondered Where am I? I didn't understand. Did my brown body not belong in the narrative? When I finally read (Mildred Taylor's) Roll of Thunder, Hear My Cry, I knew that was what I was looking for. One of the many reasons I began to write was to fill that absent space. As a child, literature that did reflect my life was mostly written for older people — like Langston Hughes or James Baldwin. Every African American in a book in my third grade classroom lived in the 19th or early 20th century, and enslavement was always part of the narrative. And it was always nonfiction. KVT: The importance of the past and family are profound threads in Brown Girl Dreaming. Could you talk about the connections between the past and family? JW: Family is part of home, and home is so important. As a child, I straddled Ohio and South Carolina. In the south, safety was in the family, and home was where we had everything we needed — food, shelter, safety, stories, religion. The family stories were very important, because we learned where we had come from. I didn't see this as a child, of course, but as an adult I realized my family had come through the Jim Crow South, so they had a sense, We survived that, so we can survive anything. KVT: Your books delve into complex issues with such depth and grace, but you also write about children facing difficult circumstances — such as meth addiction — that make some adults very uncomfortable. Could you explain why you write about what you do? JW: I write for young people, and I know adults have their own fears and challenges in understanding others, whether it's sexuality or abuse or religion, and what they're struggling with in their own mind they often put on their children. Transparency is the biggest gift adults can give kids. I know some parents try to protect their children, but that ends up negating that children live in the real world. A gift adults can give to themselves is to read these books or, better yet, read with children. I believe my books will end up in the hands of people who need to read them. Other people's fears can't be about the work I'm doing. KVT: Brown Girl Dreaming is about a young girl discovering her own unique brilliance, through writing. What advice would you give to young people who are searching to develop their own particular gifts? JW: I visit kindergarten and first grade classes, and when I ask kids what they want to be, all the hands go up. But as kids get older, fewer hands go up. Their aspirations to be dancers or ice skaters or fairy princesses are stamped out of them. They're told their aspirations are not realistic. I didn't try to make a whole bunch of money. I didn't get caught up in that game. I had really bad jobs, but all the time I was writing. We're so often sold an illusion of what we should be doing. Instead, we should move through the fear of What if I fail? What if I don't make enough money? Remember what you love and what makes you feel passionate, and hold on to that. Jacqueline Woodson hosts an author talk on Monday, October 23, 6 p.m., at Burlington High School. Geof Hewitt, Slam Poet Laureate of Vermont, leads a community dramatic reading of Brown Girl Dreaming on Thursday, October 26, 6:30-8:30 p.m., at the Waterbury Public Library. "What would it look like if we asked the whole state to read a book together?" That question inspired the Vermont Reads program, said Amy Cunningham, director of community programs at the Vermont Humanities Council. Now in its 15th year, the initiative has a simple premise. Each year, the Humanities Council chooses a well-written book, accessible to a range of literacy levels, with ample material to serve as a springboard for what Cunningham calls, "big, fat, meaty conversations." Communities design their own projects around the book and collaboration between organizations, like schools and libraries, is encouraged. Vermont Reads' 2018 selection is Bread and Roses, Too by Katherine Paterson. For more information, visit vermonthumanities.org.